Devo guitar identified! It's a custom-built Ibanez. Thanks Nic. Man sentenced for selling fake guitars: Seller of counterfeit Gibson Les Pauls get the book thrown at him, and quite rightly. Inspiration of the guitar gods: Bert Jansch's North London flat has become a haven for stars who want to learn from the folk legend. Will Hodgkinson (author of the "Guitar Man" and "Song Man" books) speaks to Beth Orton and Bernard Butler. Fall of the Roman Empire: Strat-O-Blogster Guitar Blog reports that Ed Roman Guitars has folded. The website is still up, but don't go placing any orders! Bono: "I knew Blair would be a great leader because he was a guitarist": This speaks volumes about Bono. Rock Stars Line Up For Giant Guitar Exhibition: Rod Stewart, Paul Weller, Keane and Peter Hook have launched London's Gibson Guitartown exhibition, a collection of giant guitars decorated by Noel Gallagher, Kasabian, Graham Coxon and Razorlight amongst others. Q. Are We Not Men? A. 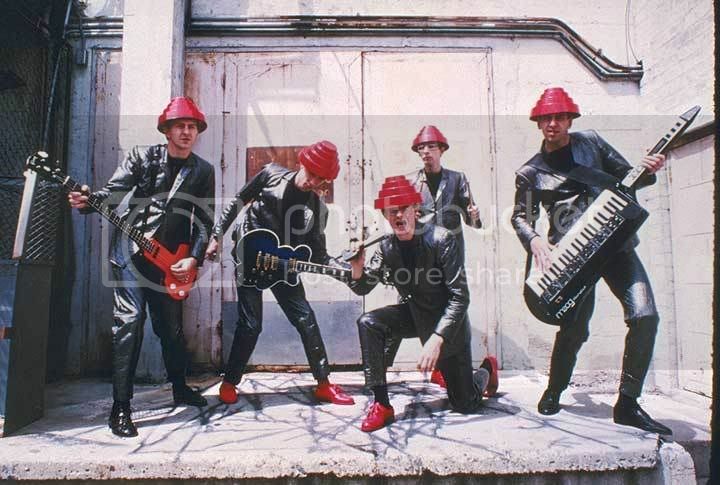 We Are Devo. I saw Devo last night at Shepherd's Bush. They were looking a bit older and greyer (and a little fatter in a couple of cases) than they are in the above photo, but their playing was absolutely spot-on. Very entertaining and totally barmy. Guitars used were a Steinberger bass (strung right-handed but played left-handed), an Ibanez Talman electric, and a couple of early G&L guitars that sounded fantastic. 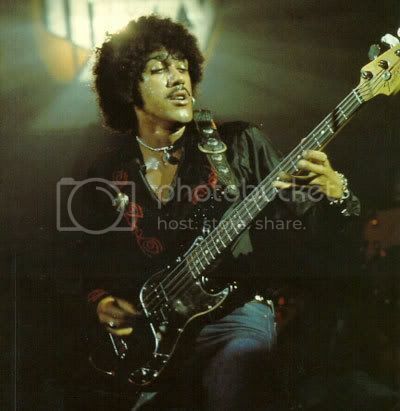 (I say early G&L because they had a simpler headstock design - without the little pointy bit, if you know what I mean). There was another bizarre carved-up looking guitar that was used by Bob 1 on "Smart Patrol/Mr DNA" for a rather manic solo and then some mechanism was triggered to break all the strings. I didn't quite see how he did that. Mark Mothersbaugh (the singer) also played guitar on "Satisfaction" - it was left-handed Strat (played right-handed) with effects pedals gaffer-taped to the body. Also, it seemed to have the 2 centre strings missing. UPDATE: A little searching on the web has identified Bob Mothersbaugh's current favoured guitar as being the G&L SC-2, a student-level guitar with pro features designed by Leo Fender to be G&L's answer to the Fender Mustang. Judging by what I heard last night, I'd very much like to check out one of these, although they are not particularly common. Devo's Bob 1 was using two of these on stage last night - a hardtail for most of the set, and one with a tremolo on one song. Anyway, all this doesn't answer my question: What is the guitar in the above photo? ANOTHER UPDATE: The Blue Potato Guitar has been identified! Thanks Nic. Deepest Purple: 1,800 Guitarists Set World Record Playing 'Smoke on the Water': Blimey! The record's been broken again already. It was only earlier this month that the previous record was set in Kansas, but now it's the Germans who are in the lead. So, where next? I'll be up for participating in a record attempt here in the UK. How does that riff go again? Staying in tune with guitar owners: C.F. Martin & Co. lets its customers try instruments at party. It's like a tupperware party, but with Martin guitars! Captain Beefheart's 10 rules for guitarists: Of course, you know this is going to be absolutely barking, now don't you? Teen musicians learn to make guitars: "I've always wanted to build my own guitar and I finally got the chance," said the North Iowa High School senior as he worked on his instrument during a guitar-building class at Forest City High School. I wish we'd had these kind of opportunities back in my schooldays. Guide to Pink Floyd's Dark Side: The Oz experiment and other tidbits. Art or music? Stones guitarist Ron Wood does both: Sorry, but I'd always been under the assumption that music was an artform. Silly me, eh? How to convert your acoustic guitar to have a cutaway: Warning! Bodge job alert! Man gets sick benefits for heavy metal addiction: A Swedish heavy metal fan has had his musical preferences officially classified as a disability. The results of a psychological analysis enable the metal lover to supplement his income with state benefits. Oh dear... Mike Oldfield's "Tubular Bells" guitar failed to sell again. (See yesterday's blog entry, below). It's up for sale again! This guitar is the original 1967 Fender Telecaster used by Mike Oldfield and was the only electric guitar sound source on his breakthrough "Tubular Bells" debut LP. The guitar was formerly owned by Marc Bolan, it was originally white, has had refins and was then stripped to natural. 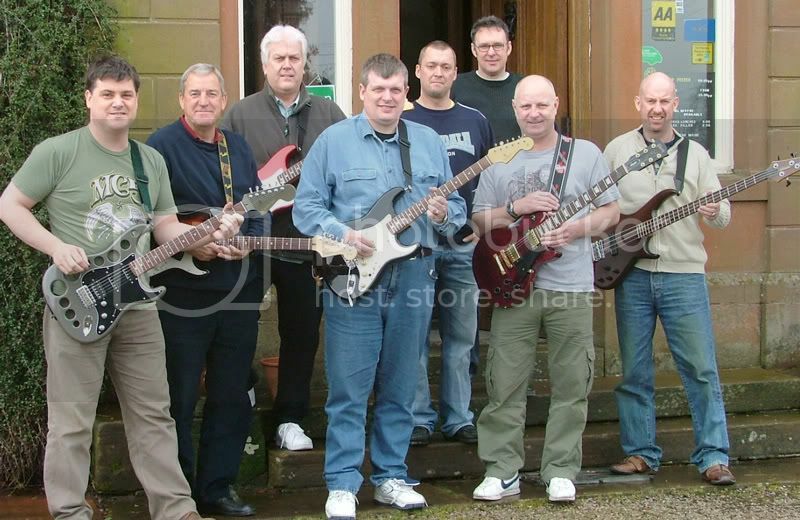 The middle pickup is a Bill Lawrence, routed and fitted by Mike Oldfield and his father in their garden shed. The guitar is estimated to fetch between £25,000 and £35,000 when it goes under the hammer at Bonhams in London, although the last time this was put up for sale in May 2006 (on eBay) the auction ended at £7,501.00 - reserve not met (i.e. unsold). Mike Oldfield is donating all proceeds from the sale to the mental health charity Sane. I hope he manages to sell it this time. Felix the Cat goes Psychedelic! Here's the third in what would appear to be a series of Felix the Cat guitars from none other than the legendary C.F. Martin & Co: the Martin FeLIX III. Whilst I do think it's a nice fun design, I did prefer the design of the previous FeLIX II guitar. Weighty recognition: C.F. Martin & Co. honoring songwriter with special guitars: That's Robbie Robertson of The Band, who supposedly put Martin's hometown of Nazareth on the rock 'n' roll map. Book Review: Gibson Guitars: Ted McCarty's Golden Era 1948-1966 Showcases Guitar's History over at blogcritics.org. Marc Bolan's Flying V is a 21st Century Buy: Kerry Morgan forks out £37,000 at auction for Bolan's guitar, which he's going to display in Wales' only private club for smokers. I hope he's going to put it in a glass display cabinet - imagine the discolouration it'd get from all that nicotine. Dougherty inspired by dad's old Beatles guitar: Nick Dougherty, the first-round U.S. Open leader with a 2-under-par 68 at Oakmont Country Club (I think this means he's a Golfer - sorry, I don't do sport), grew up in Liverpool and tells the story of the time his father traded in a guitar once owned by the Beatles' Paul McCartney to get his son a flute! You can leave comments, you know. It feels like I'm talking to myself here. Guitar Wars: Which instruments would the denizens of the Star Wars universe play and why? Jack White and John Mayer: Twin sons of different mothers - so says the Los Angeles Times. BC Glass Studio make custom handmade one-of-a-kind fused glass guitars. Which you can't play - these are sculptures. TechEBlog » Feature: Geeky Guitars: I can understand why someone might want a folding guitar, and perhaps the KaossPad installed into a guitar, but making guitars out of games consoles seems a bit silly. The 5-Minute Interview: Hank Marvin: "You can never have too many guitars. I have 40 at the moment." Guitar Solos Quiz: match the soundbites to the list of songs. (We scored 100% here in the office, but it was a joint effort. Personally, I'm not too well up on the likes of The Grateful Dead and Yes). Here's another new toy. I've had it for two weeks now. I decided that I needed a dedicated 12-string electric. My only 12-string was one half of my Danelectro doubleneck, and I was finding it too cumbersome. If I ever fancied playing 12-string, then the doubleneck was too much of a pain to play for extended periods of time. I suppose it's a stage guitar really, rather than one for playing around the house or for recording. This Stratocaster XII, however, is the business. The neck is actually thinner at the nut by a whole millimetre than that of an American Standard Strat. It wouldn't be to everyone's taste, but for me this means it's an ultra-playable twelver. The extra-wide necks on 12-strings was one thing that always put me off. I did consider a Rickenbacker as an alternative, by the way; I've played Ricky XIIs in the past and they play fantastically (although personally I'm not too fond of the design), but the Stratocaster XII was more suited to my budget. If you look at Fender's website you'll see that this model is only offered in three finishes: sunburst, lake placid blue, and Burgundy Mist Metallic. However, mine, as you can see in the picture, is Candy Apple Red. A quick check of the serial number (Q + 7 digits) reveals this guitar was made by Fender Japan between 2002 and 2004, so it could be a discontinued colour or else a Fender Japan guitar not intended for export. So... 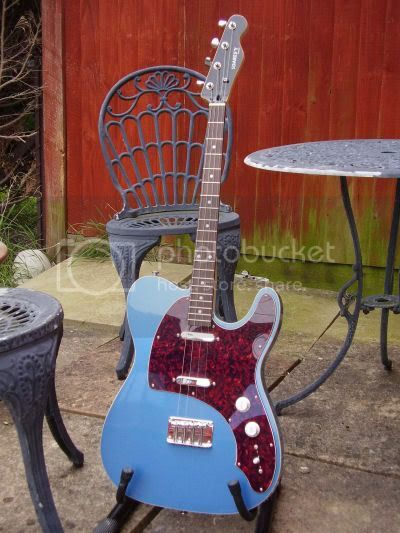 Does anyone want to buy a Danelectro doubleneck? Seriously. I'm looking for £300 GBP for it. I went to see Gary Moore last night. Blimey, I don't half feel inadequate as a guitarist now. Nice to see his old Thin Lizzy chum Brian Downey on the drums too. Also, the support act were top notch too - a blues guy called Otis Taylor and his band (including his daughter Cassie on the bass) playing what they call "trance blues". I've been listening to his latest album "Definition of a Circle" and have been really digging it. Guitar Record Set to Smoke On The Water: More than 1,680 guitarists broke a world record by playing DEEP PURPLE classic SMOKE ON THE WATER simultaneously yesterday (03Jun07). Back in March I spent a weekend in the Lake District playing guitar as part of one of these Guitar Weekends. Now despite being a total guitar nut, I'm not exactly the world's greatest player. I'm largely self-taught and have not learnt any theory over the years, so the idea of attending one of these courses seemed perfect. The course I attended was an "Improvers" courses. Other courses offered include a more basic one for "strugglers", or more advanced courses such as those for Blues and Django-style playing. It was an intense course. We played all weekend up until midnight on Friday and Saturday nights, with breaks for meals. The accommodation and food was absolutely top-notch. It was great to play in a group situation with others and to learn some of the techniques of rhythm and lead playing (we each had spots at taking a solo), and to learn some of the music theory behind it all: how to ascertain which key a song is in, how to apply the understanding of scales and how to solo in that key. It was so good that I'm considering going again! BTW, guess which one of the chaps above is me? (Older readers of this blog will probably recognise my guitar). Here's an eBay purchase from earlier in the year. 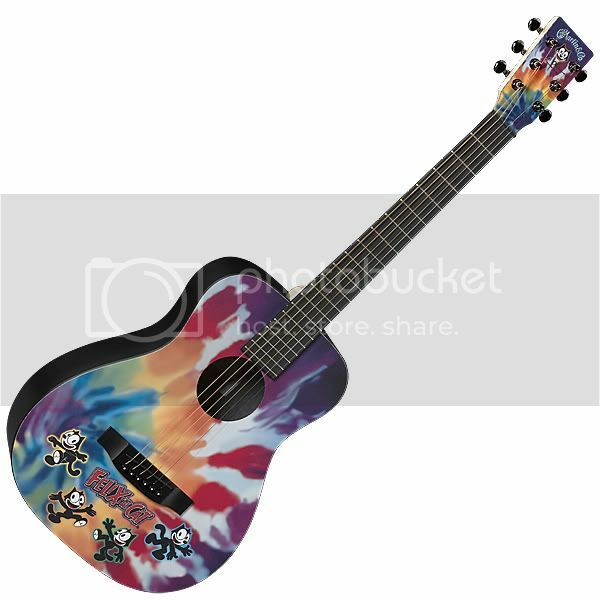 As older readers will know I am quite interested in guitars with reduced numbers of strings, and am a fan of the baritone ukulele which is tuned the same as the first four strings on the guitar. I was intrigued to try out a similar electric instrument, and I got a good deal on this Soares'y tenor guitar. However, I found the sound to be too bright for the usual DGBE tuning, so have been experimenting with open tunings on it and also trying to teach myself a little slide. Apologies to everyone for the extended hiatus. I was just having a longer-than-usual lunchbreak. But now I'm back to compete with the multiplicity of Guitar Blogs that have sprung up in recent times. So, what's new, you're asking? Well I'm not going to try to catch up with all the news I've missed out on in recent times, other than to mention in passing those fantastic Japanese 12-necked guitars which are in fact art works by Yoshihiko Satoh, the guitars made from hemp, and the news that Ovation have returned to the solid-bodied electric market with their exciting new hybrid electric/acoustic VXT guitar. 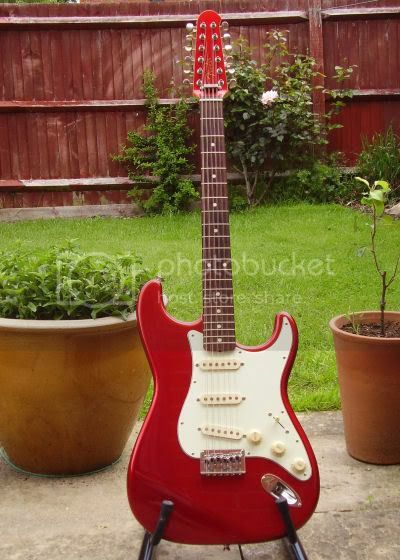 Oh, and I see there's another Jimi Hendrix Strat up for auction!